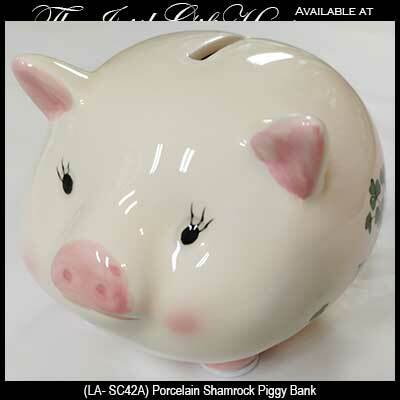 Irish piggy bank features green shamrocks along with pink accenting. This shamrock piggy bank would make a fine baby gift or it could be an ideal gift for someone saving for a trip to Ireland. 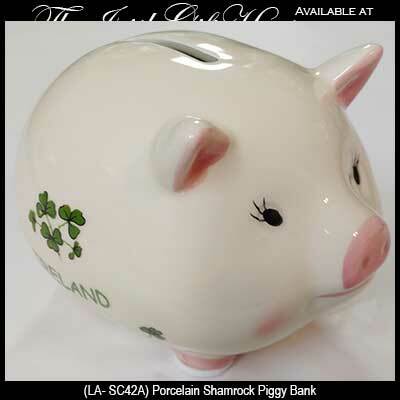 This porcelain Irish piggy bank features shamrocks and is enhanced with pink accenting. The shamrock piggy bank measures 4 1/2" long x 3 3/4" wide x 3 1/4" tall and features a bottom rubber stopper and padded feet. The Irish piggy bank is made in Ireland by Liffey Artefacts and is gift boxed with a shamrock history card, complements of The Irish Gift House.